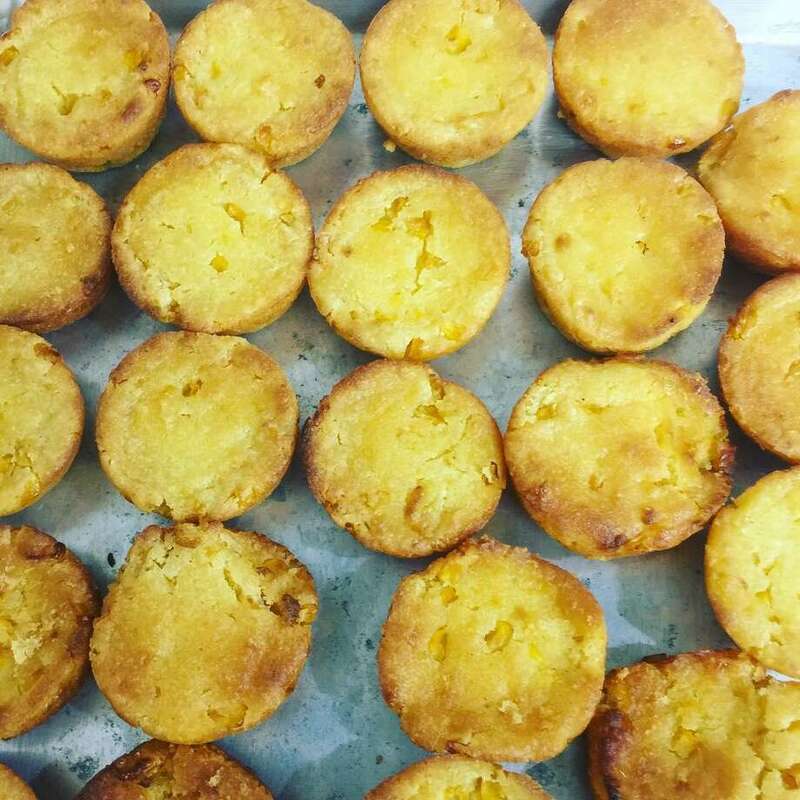 Corn bread at DrewbaQ are like little muffins. In the parlance of Hollywood, food trucks should be “high concept,” meaning that with one glance you know what they serve and the ambiance and flavor they are going for. I first found the DrewbaQ truck parked in Kennedy Park in Danbury. Maybe my brain is getting slow but it took me a while to figure out exactly what I was looking at. What was DrewbaQ and did I want to eat it? It wasn’t until I took a look at what its customers were walking away with that I realized this was no-nonsense barbecue and well worth standing in line for. It wasn’t too long ago that if you were not a mid-westerner from the wrong side of the tracks, you never heard of burnt ends. Burnt ends and rib tips were poor man’s BBQ. Basically they are the chunks of meat that fall to the bottom of the grate when the meat is slowly cooking. They are also the single best thing one could ever find on a menu. You can keep the succulent juicy interior slices of brisket, just give me the scorched debris. The side dishes here are simple and good. Mac ’n cheese with a homemade cheese sauce, crisp cabbage coleslaw, BBQ beans and corn bread are the standards. I was expecting more from the beans, which turned out to be simply beans in a mild tomato-based sauce. I like barbecue beans floating in the rich thick barbecue sauce used on the meats and with crisp shreds of the barbecue meat mixed in. But that is my taste and I have eaten at many Texas BBQ’s that serve beans just like these. The most surprising side dish was the corn bread. When I see corn bread on most Connecticut menus, I cringe. It is usually a dreary boxed mix. dry as a bone and tasteless. The great surprise was that here at DrewbaQ the corn bread was little semi-sweet muffins, rich and buttery with kernels of corn studding them. This seemed like someone’s cherished recipe, and if it isn’t it should be. Give me the recipe and I will make it mine! I got a visual at pretty much the whole menu because at Kennedy Park I sat next to what appeared to be the entire Danbury Fire Department. OK, maybe not all of them but two long tables of guys you can be sure know a thing about fire and smoke. Firemen eat a lot and the ones I know are very picky. Back at the firehouse there are some outrageous cooks! Once the crew got its orders from the truck, it took the Danbury brigade about 15 minutes before the rib bones piled up like a vulture’s night out. I had ordered quite a bit if food myself and was yet again surprised at how good regional American food in Connecticut has gotten. The brisket was terrific. Anyone who has tried to smoke a beef brisket knows how hard it is to get it just right. It is a pretty unforgiving and tough hunk of cow and it needs hours at the right temperature over the right wood to yield its deliciousness. Like a diva, it cannot be rushed. The pulled pork was also exemplary, the kind of meat that wants you to hold back on the barbecue sauce. The smoke tang stands on its own, which is the trademark of pulled pork done right. Unlike some food trucks in Connecticut that I have come to call “Ol’ Reliable” because they are always parked at the same place, DrewbaQ scoots all over the state. To find its location you must go to their website, which they keep well updated. You will be amazed at the far-flung journey this truck makes in the course of a month. I think their food is so good that I might be putting the cart before the horse, but knowing they are going to appear at a particular event or fair made me suddenly want to go to it. The time I ate at the truck I did not see any deserts listed. Maybe they were out that day or maybe I was too busy stuffing my face with the “que” to notice. Since then I have heard from a very good authority (a fireman friend) that their pecan pie and lemon squares are the finest around. I can’t wait for another opportunity to chow down here.